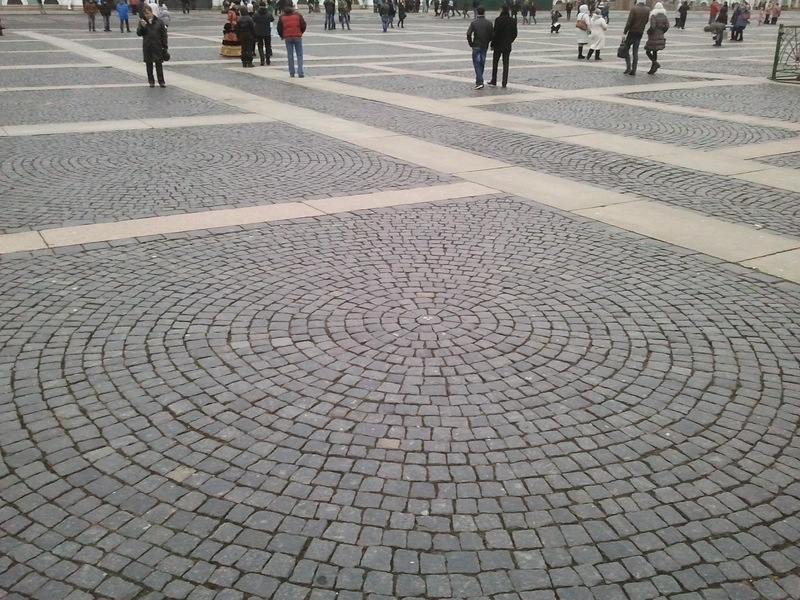 Logarithmic zoom at the Palace square, Saint Petersburg. 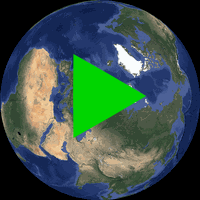 This post continues the previous one: Log-Polar coordinate system applied to Google maps. 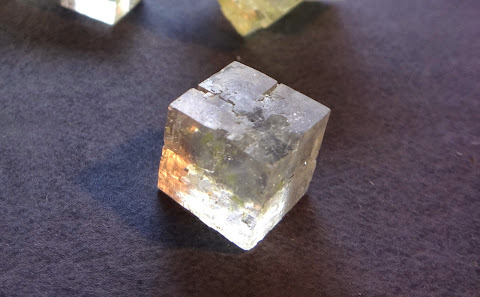 Now I made an attempt to extend the set of Google maps images with own photos, to make an image showing things at scales from millimeters to tens of thousands of kilometers. 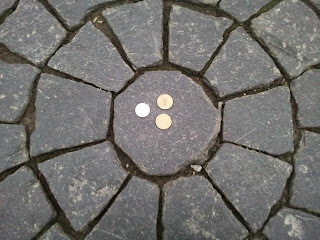 Several coins on the bricks of the Palace square. Click to open it in full resolution (2692 x 8897). The picture above is in logarithmic polar coordinates, with center at the specific point on the Palace square in Saint-Petersburg. I put a few coins on a bricks of the square to slightly animate the view and provide some scale reference. On this image, vertical coordinate shows distance from the center of the coin. Horizontal coordinate corresponds to angle. Since the central coin is round, it looks like a yellow band at the bottom of the image. It is composed from many sources. Maps were taken from the Google, and the close-up photos were taken by me and processed with Gimp to remove perspective distortion. To convert regular photos to log-polar coordinate system a self-written script: log-zoom (Github) was used. Animated zoom, obtained from the top image. To load GIF animation (8 Mb), click the image. 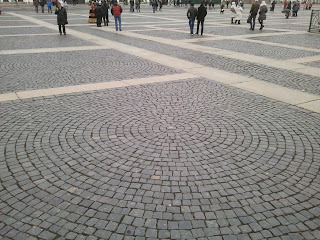 Bricks on the square, arranged in a circular pattern. Close-up view of the coins. 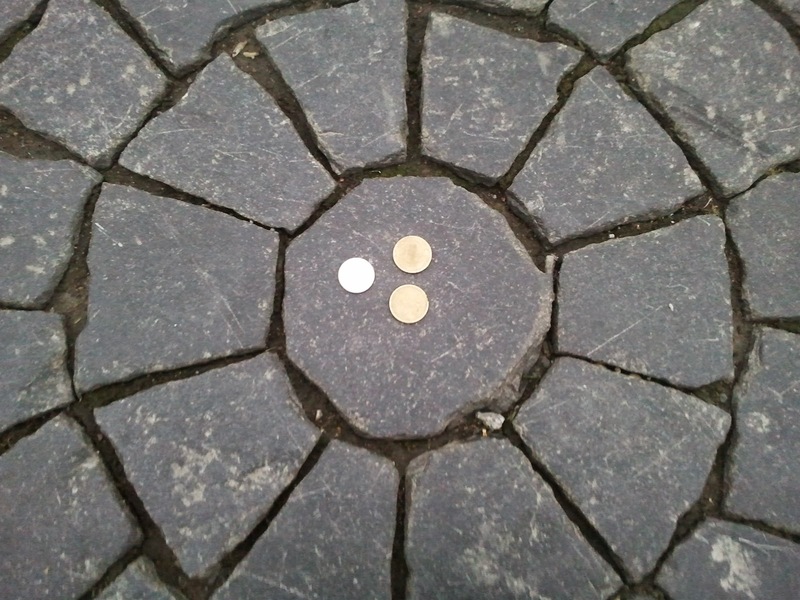 Three coins on the central brick. Center of the log-polar coordinate system is in the center of one of them. Drawing of the central coin. Finally, a design of the central coin. 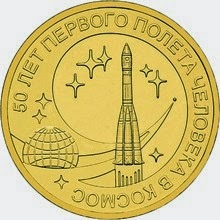 The text around the border says "50 years since first manned space flight".